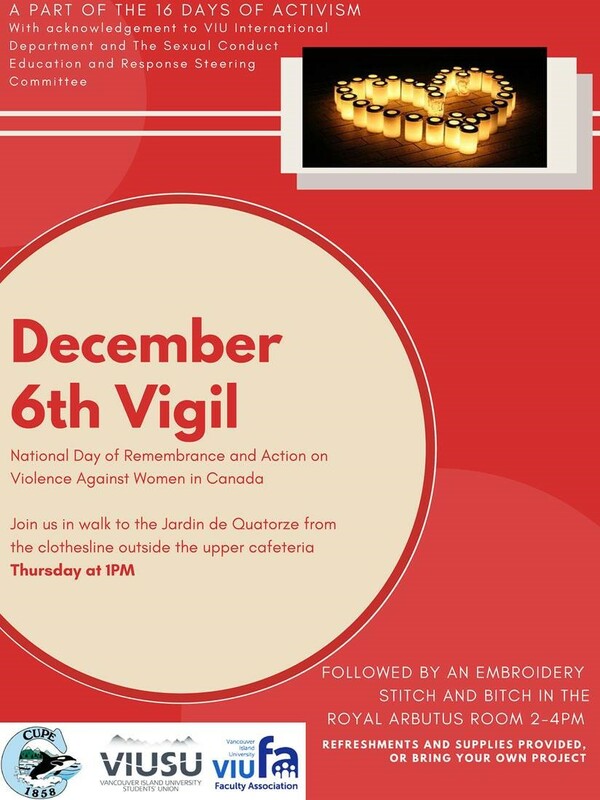 Please join VIU and Nanaimo community members for the December 6th Vigil: A National Day of Remembrance and Action on Violence Against Women in Canada. We will meet at 1 pm at the Clothesline Project (located just outside the main cafeteria), and then march to Jardin de Quatorze for a period of reflection. Sheila Malcolmson, Nanaimo-Ladysmith MP and Critic for Women’s Equality, has confirmed that she will be joining us to share news from Ottawa about the Status of Women. Please share this event and invite friends, colleagues, neighbours, and family.